As cute as they may be squirrels can also make themselves into pests and lose their welcome in your garden. 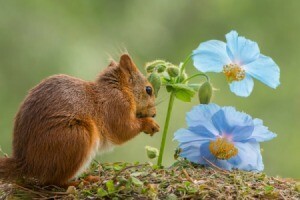 This is a guide about squirrels eating flowers. My grandparents have a problem with squirrels. They're always in our yard, and eat my grandmother's tulips by breaking off the center of these flowers and then spit the petals. In doing so they destroying my grandparents favorite spot. What can we do to solve this problem? Unfortunately, Tulips are one of a squirrels favorite garden flowers to snack on-especially it seems, the lighter-colored ones. If your grandmother is currently feeding the squirrels that come into her yard, you might suggest she move the feeder far away from her tulip bed and offer them an appealing alternative (like corn cobs or peanuts) while the tulips are in bloom. If she isn't feeding them, she may want to start. I keep my squirrels very well fed and place chicken wire over my tulip bulbs after planting them in the fall. So far, the squirrels don't seem one bit interested in my flowers. Next year have your grandmother soak her tulip bulbs in Deer-Off or a similar repellent before she plants them. Most squirrels will also stay away from ammonia, urine or the scent of a predator. Products containing these scents can be purchased at a garden center and sprayed around growing plants. If you or someone you know has a dog, next time the dog gets a hair cut, you might save some of the clippings to spread around the flower bed. You could use your own hair, too. Cats also make good deterrents, but they shouldn't be allowed to run loose in the city where they can easily prey on songbirds. Let your grandmother know that squirrels dislike daffodils, ornamental onions, and hyacinths. Live-trapping and relocating them is kind of a last resort and only works for a short time until new squirrels to move in. I hope these ideas help. Good luck. Sprinkle cayenne pepper over all the tulips. They won't be back. My husband had this problem with chipmunks getting into the flowers at the country club where he works as grounds keeper. He said one thing is to plant daffodil bulbs they hate them. Another idea is to scatter pieces of Irish Spring soap. To keep some animals out of gardens just sprinkle some human hair around. So next time you get your hair cut remember this tip, and ask for it back. Before planting bulbs wrap them in a wire type mesh, that the roots can grow through, and then plant them in the ground. The rodents cannot eat them. Mix hot pepper sauce with water and spray it on the tulips. You will have to reapply after rain. I live in a garden apartment and my upstairs neighbor feeds the very large squirrel population. I love to grow flowers in planters on the stoop, but the squirrels uproot the flowers and I find them lying dead next to the planters. Does anyone know any "annual" flowers that they don't like or have any suggestions? I'm so tired of spending money on flowers and it also makes me so sad to see them destroyed. (Forget the neighbor, as no one can make him stop feeding them.) Thanks. Cedar squares like you hang in closets will help as well. Put them on top of your planters. And rubber snakes, as long as you remember they are there! And fake owls work for a while.